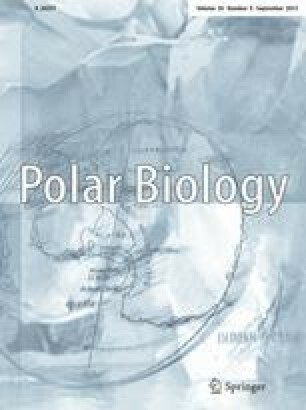 The objective of the present study was to assess the feeding habits of bearded seals (Erignathus barbatus) from the Svalbard area, Norway. Stomach and/or intestine contents were collected from 47 individuals shot between May and September (1989–1996). Prey specimens were identified from whole specimens or hard items such as fish otoliths, crustacean exoskeletons, cephalopod beaks, polychaete jaws, gastropod operculae and mollusc shell remains. To show the dietary contribution of the different prey items found in the gastrointestinal tracts, the frequency of occurrence and the numerical frequency methods were used. Fifty-nine percent or more of the gastrointestinal tracts contained five or more prey organisms. The most frequent fish species recorded was polar cod (Boreogadus saida), which was found in 49% of the gastrointestinal tracts, followed by sculpins (Cottidae spp.) (44%), long rough dab (Hippoglossoides platessoides) (28%) and the stout eelblenny (Lumpenus medius) (18%). The most frequent crustaceans were the spider crab (Hyas araneus) (59%), Sabinea septemcarinatus (54%), Sclerocrangon boreas (46%) and Lebbeus polaris (18%). Of the molluscs, the whelk Buccinum spp. occurred in 18% of the gastrointestinal tracts. Other species such as cephalopods, polychaete worms, amphipods and echiuran worms occurred in small amounts. There were no significant differences in foraging behaviour between males and females. This study also shows that in the Svalbard area bearded seals are benthic feeders and utilise a wide variety of organisms.